For years, I’ve been badgering the poor guy to bring Hark in as a special guest at the San Diego Asian Film Festival. Hark’s “flying people” epics are among the most entertaining and dizzyingly stylish period films ever to come out of Hong Kong. There’s no personal appearance this year, dammit, but how about the next best thing? Thanks to Hu’s booking prowess, San Diegans will be among the only Americans to see Hark’s latest as it was properly intended. The film, understandably, was not shown ahead of time for local critics. A screening link was offered, but I thought it wise to wait and see the film when it screens Saturday, April 18, at 7:50 p.m. as part of this year’s 5th Annual Pac-Arts Spring Showcase, with a repeat presentation Monday, April 20, at 8:45 p.m. Promising to spare me “the overtly sentimental or kiddie ones,” Hu once again cobbled together a tailor-made screening packet for this reporter. Having never known a bad film to come out of Iran — and armed with the knowledge that it’s Hu’s festival favorite — second behind Hark in this year’s lineup was Today. Too bad USPS couldn’t make good a Saturday delivery in Escondido of an envelope mailed Thursday from Liberty Station. Nor did Dropbox want to cooperate: an hour in and the streaming screener froze; the only on-screen movement was generated by Apple’s spinning rainbow wheel. Happily, there are worse things in life than having to leave home to go to a theater. Today screens April 20, at 4:40 p.m. and April 21 at 6:25 p.m. In addition to all this, expect a landmark retrospective of Vietnamese American cinema, including two presented in 35mm! All films screen at UltraStar Mission Valley at Hazard Center. For more information and a complete schedule of films visit PacArts.org. Here are reviews of two films I was able to watch in their entirety. 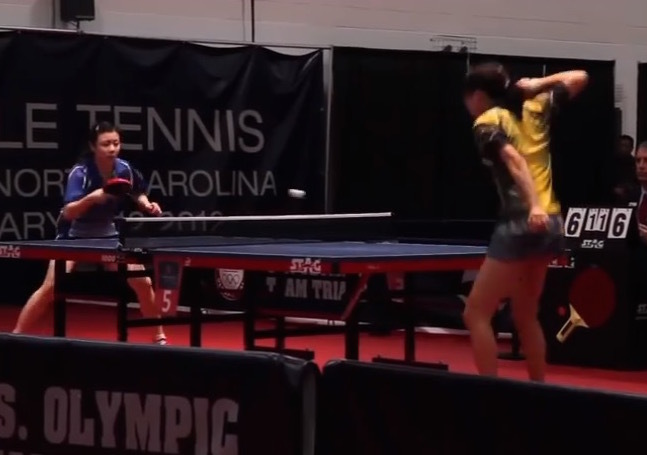 Table tennis does not exactly jump to mind when one thinks of Olympic sports, and filmmakers Mina T. Son and Sara Newens don’t put enough spin on their ping-pong pic to make either a convincing argument or a compelling documentary. A sensation in China, here in America ping-pong as a sport never evolved much beyond garages or basement rec rooms. But if there is a dime to be made off it in open competition, you can sleep secure knowing somehow, someone will devise a way to turn it into an Olympic event. What next? Medals for foosball and air hockey? How about a beer-pong decathlon? The girls are slaves to their parents’ dreams while ubernerd Michael and his correspondingly geeky folks are at times suffocatingly difficult to watch. You want to throw the kid a life preserver. Once the trio of teens are let loose in open competition, their rigorous, arm-flailing table strategies are no match for the static camcorder coverage. Those predisposed to pong will want to catch the film when it shows April 23 at 6:30 p.m.
Operating under the assumption that, like me, most of you have never read Dostoyevsky’s A Gentle Creature, the short story upon which Vietnamese director Le-Van Kiet’s latest is based, I’ll withhold certain plot twists. Flashbacks reveal two key puzzle pieces (and a convoluted time frame) early on. Opening on a mid-Vertigo POV-plummet, we’re never sure what exactly caused the young woman to tumble to her death until the film’s climactic reveal. A few scenes later, we see a local pawnbroker, already established as a gentle soul, tending to the body. The moments that separate the events, and the time leading up to them, form the film’s inner-narrative. Thien (Dustin Nguyen, thousands of miles from 21 Jump Street) asks his housekeeper to gather information concerning a local churchgoing 18-year-old girl, Linh (Nguyen Thanh Tu), who of late has been frequenting his pawnshop. Her report back places Linh living with a pair of unabashedly evil aunts who want to pawn their niece off on the local butcher, an “all-day drunk” more swinish than any of the pigs he sells. It’s not enough to learn of her mistreatment; Thien inquires as to the depths of their cruelty. Only then can he propose marriage. Seeing how we’re led to believe that Linh would rather die than face whatever plot mechanics the script calls for, the “set ’em up to watch ’em die” flashback structure makes it difficult to mount suspense. Hardest to swallow is Thien’s sudden conversion from caring soul to a jealousy-jacked brute possessed with a table clearing technique that rivals that of Jake LaMotta. Linh lets out one last cry for help, taking a razor to her wrists. Perhaps something was lost in the translation, but it’s hard to imagine a doctor tending to a suicidal patient prescribing a day at the beach as a cure-all. Well acted, lit, and staged, Gentle screens once on April 20, 6:30 p.m.